A manor surrounded by vegetation, a breathtaking view of Lake Como and a staff of experts at your disposal. Just 43 km from Milan. The Castle of Rossino is the ideal solution for those looking for an event location in a castle near Milan. A place to relax and enjoy one of the most beautiful natural landscapes in the world, the landscape of Lake Como. The Castle of Rossino is perfect if you wish to organize a truly exclusive event, from weddings to conferences. Those looking for a location for a conference or a seminar will find that the Castle of Rossino is the perfect setting. The fortress, structured on three floors and surrounded by a large park, can easily accommodate business events throughout the whole year. The rooms on the upper floors can be set up with rows of seats, while the ground floor could be dedicated to coffee breaks or buffet lunches. An expert team will be available to help you select the best layout. This castle near Milan is also great for team-building events. Days devoted to consolidating team-spirit with activities that can go from cooking lessons to role-playing games. 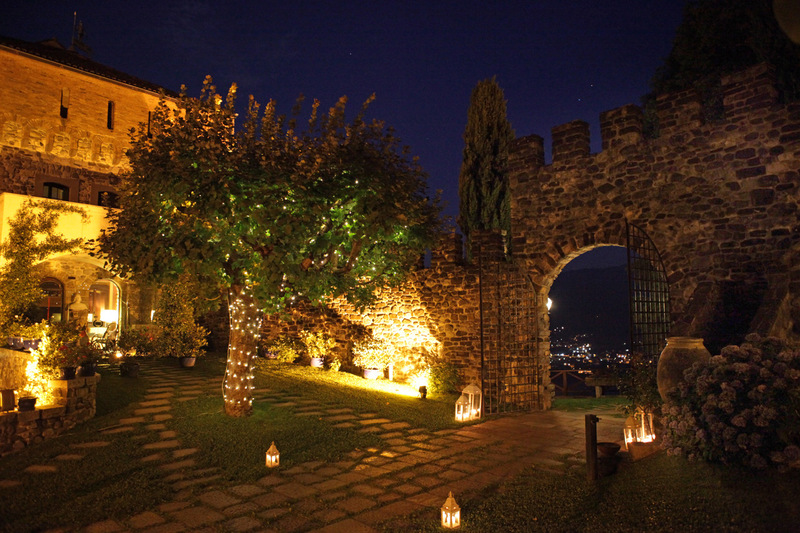 A medieval manor overlooking Lake Como, the perfect place for a true fairytale wedding. The Castle of Rossino will make your wedding unforgettable, captivating your guests with its beautiful frescoed rooms and landscaped gardens. Those wishing to get married with a civil rite can exchange rings in the lush garden of the Castle or in one of the inner rooms. Since June 2015 the castle has been approved by the Town Council of Calolziocorte as a venue for civil weddings. Those dreaming of a religious marriage can choose one of the many churches nearby. We remind you that the municipality of Calolziocorte, on the slopes of the manor, has six parishes. For the organization of the wedding, the spouses can use a team of experts who will follow them in the choice of every detail: from the menu to the decorations. And their wedding night can be spent in the Tower Suite, located on the top floor of the Castle, with a beautiful view of Lake Como and the San Martino valley. The Castle of Rossino has numerous clients even outside the area of Lake Como. We provide our services to customers seeking a castle near Bergamo, a castle near Monza Brianza or a castle near Canton Ticino. Send us your enquiries and we will be glad to reply promptly to all your requests.